Many Shops in Kanpur gutted by fire;slum girl dies. 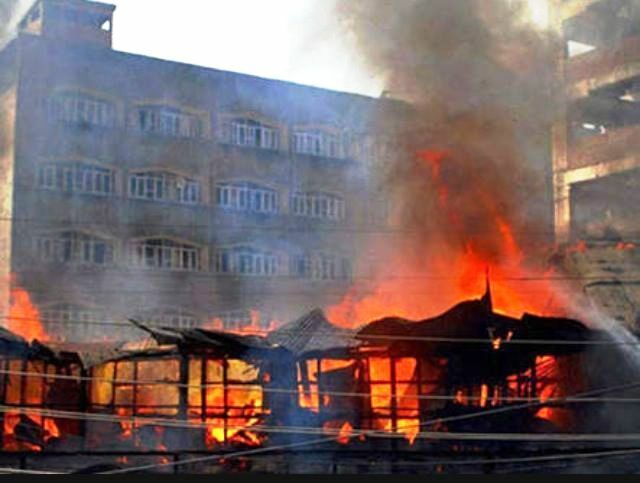 The fire caught in Parade Bazzar under Kotwali police station on Saturday morning that burnt many shops to ashes; and a girl,10, Chandni, daughter of watchman, Laxmi Narain, charred in shanties. According to information, the fire caught in early morning. The fire brigade vehicles and police are trying to control it, but the engulfed fire could not be pacified till the report sent. Shalabh Mathur, SSP, said, “The fire may have caught because of short circuit”, but the statement of shopkeepers differ that it was torched. The shopkeepers are anger, while police and administration are persuading these people. The PAC and para-military force have been deployed there monitoring the situation. The tension has prevailed after the brawl. The nearby residents have said, "Many footpath vendors who come here from outskirt areas for the business purpose halt their night on roadside. It is apprehended that death toll may rise." Mr. Nabi Ahmad told, “Many families of shopkeepers were sleeping inside when the fire caught.” The exact figure of death toll may be confirmed after the extinguishing of fire.